This section explains what you need to know to apply for your retirement benefits. It describes the documents and forms you must provide before you can receive benefits and how to choose your pension effective date. The following section, How Retirement Benefits are Paid, explains how benefits are paid and how to choose your payment options. This section explains the process of retiring from work and applying for benefits. It tells you what you need to know when choosing a pension effective date and deciding how your retirement benefits are paid. 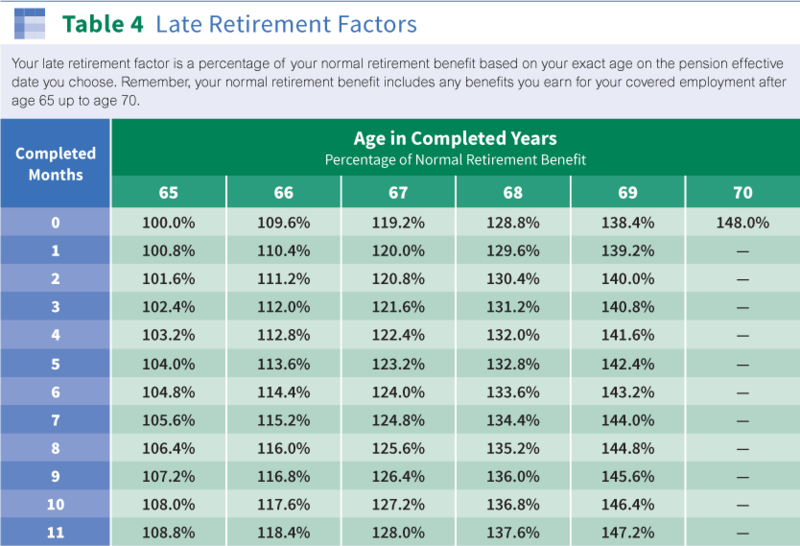 The shaded box below summarizes what you must do to begin receiving each type of retirement benefit. The Trustees must approve your application. You must intend to retire permanently from employment with your most recent covered employer and your employer must certify that you are no longer employed. You are not considered retired from employment just because you transfer from covered employment to employment in a non-covered job with the same employer. Also, you are not considered retired from employment just because your employer stops being a covered employer under the Plan. If you are working several different jobs that are all for covered employers (for example, you work out of a hiring hall), your most recent covered employer may actually consist of more than one employer. In those cases, the Plan looks at all the covered employers you worked for in the 12 months before your elected pension effective date to identify which ones are considered your most recent covered employers when applying the Plan’s retirement from employment rules. Keep in mind that affiliated corporations and unincorporated businesses under common ownership are considered to be the same employer. For example, if you leave covered employment and go to work for a subsidiary corporation of the same employer, you are not considered retired from employment and you cannot have your early retirement benefit begin. When you apply for early retirement benefits, your application package contains a form called Certification of Complete Severance and Termination of Employment. If you are under age 65 and applying for early retirement benefits, this form must be completed. Additional information regarding this form is provided below. If you return to work for the same employer for any number of hours within six months after you stop working, Plan rules assume you did not intend to retire permanently. Your benefits are temporarily suspended while you provide proof that you really did intend to retire on a permanent basis. If you do not provide satisfactory proof, then your early retirement benefit is canceled. This means you must repay any early retirement benefits you already received. Your main reason for leaving was to qualify for Plan benefits. These retirement rules do not mean that you can never return to covered employment after you retire. Once you retire from employment, you may return to work in covered or non-covered employment. However, you will forfeit your right to receive your retirement benefit payment for any calendar month when you work in suspendible covered or non-covered employment and the hours you work equal or exceed your applicable hours limit. These rules only apply up to age 65. Here is more information about your Plan’s suspension of benefits rule. If you are under age 65 and return to work for the same covered employer for any number of hours within six months after you stop work, Plan rules assume that you did not intend to retire permanently. Your benefits are temporarily suspended while you provide proof that you really did intend to retire permanently. If you do not provide satisfactory proof, then your early retirement benefit is canceled. This means you must repay any retirement benefits you already received. To begin receiving early retirement benefits, you must be considered retired from employment. Early retirement means you are retiring before age 65. Other eligibility requirements are explained in the Early Retirement section. To begin receiving disability retirement benefits, you do not need to be retired from employment. However you must be totally and permanently disabled and entitled to receive disability benefits under the federal Social Security Act. Other eligibility requirements are explained in the Disability Retirement section. To begin receiving normal retirement benefits, you do not need to be retired from employment. You just need to be age 65 or older and vested. You can start your pension benefits no matter how many hours you are working. You must still complete and file an application for benefits. The details are explained further in the Normal Retirement section. Note: Your collective bargaining agreement may control whether you can still continue your covered work after you start receiving your pension benefits. Many contracts have rules that concern loss of seniority or other rights at retirement. If you are age 65 or older and intend to keep working for the same employer after your pension starts, be sure to find out about these rules beforehand from your local union or employer. When you are ready to retire, you need to file an application for benefits with your Administrative Office. You may request an application packet from your Administrative Office. Your application packet contains two forms. The first is called the Age/Disability Retirement Benefit Application. All participants requesting retirement benefits from the Plan must complete this form. On this form, you select the type of pension you are applying for (age retirement, disability retirement or both) and the pension effective date you want. You must also provide personal data on this form (such as your mailing address and information about your employment history). Your application cannot be processed until your Administrative Office receives your signed and dated Age/Disability Retirement Application. The second form in your packet is the Certification of Complete Severance and Termination of Employment. If you are under age 65 and applying for early retirement benefits, this form must be completed by you and your most recent covered employer. It has two sections—one that you complete and another that your last covered employer must complete. Even if you are no longer working for this employer or have transferred to a non-covered position with this employer, your employer must complete the form. If your employer is no longer in business or was purchased by another company, please enter this information on the form. The information you provide helps your Administrative Office in documenting your termination of employment. If you have questions regarding this form, contact your Administrative Office. It normally takes about three months to process your application. Benefit payments cannot start until your application is processed and approved. If your application is approved after your pension effective date, you receive benefit payments retroactive to your pension effective date. Note: Your early retirement application cannot be processed until your Administrative Office receives each of these forms signed and dated. If you have questions regarding these forms, contact your Administrative Office. The best time to apply for Plan disability retirement benefits is when you apply for disability insurance benefits from Social Security. You do not need to wait for your entitlement letter from Social Security before applying for Plan benefits. In general, Social Security requires a five-month waiting period to qualify for disability benefits. If you are age 55 or older, or eligible for early retirement under PEER, you should check both the Age and Disability boxes on the Age/Disability Retirement Application you send to your Administrative Office. That way, your application for age retirement benefits can be processed while you wait for your Social Security Disability Award Certificate from Social Security. If you meet all Plan eligibility requirements for early retirement, you can begin receiving age retirement benefits to cover Social Security’s five-month disability waiting period plus any period of delay while Social Security processes your application for disability benefits. Once Social Security approves your application and you provide your Administrative Office with a copy of your Social Security Disability Award Certificate, your application for a disability retirement benefit is approved (assuming all Plan eligibility requirements are met). If the amount of your disability retirement benefit is greater than your early retirement benefit, your monthly benefit payments are adjusted to the higher amount retroactive to the effective date of your disability retirement benefit. If your application for benefits is denied, your Administrative Office notifies you in writing of the reasons for the denial. The notice also explains how you can appeal this decision. Click here for details about your Plan’s appeal procedures. Your pension effective date is the date when your Plan benefits are first payable. It must be the first of the month. If you are married, your spouse must consent to your choice of a pension effective date, no matter which benefit payment option you choose. Other rules that affect your choice of pension effective date are explained next. You can choose to start your retirement benefit on the first of any month after you are eligible for early retirement and are considered retired from employment. Usually, you become eligible for early retirement on your 55th birthday (sometimes called your earliest retirement date). However, if you are not vested when you reach age 55, your earliest retirement date is postponed until the first of the month after you vest. You may be able to retire before age 55 if you qualify for the Rule of 84 or a PEER program. Click here for more information. If you retire before age 65 (age 62 if you have recent coverage) and are not eligible to retire under PEER, your benefit amount is reduced for early retirement. This reduction accounts for the longer period of time you are expected to receive payments. 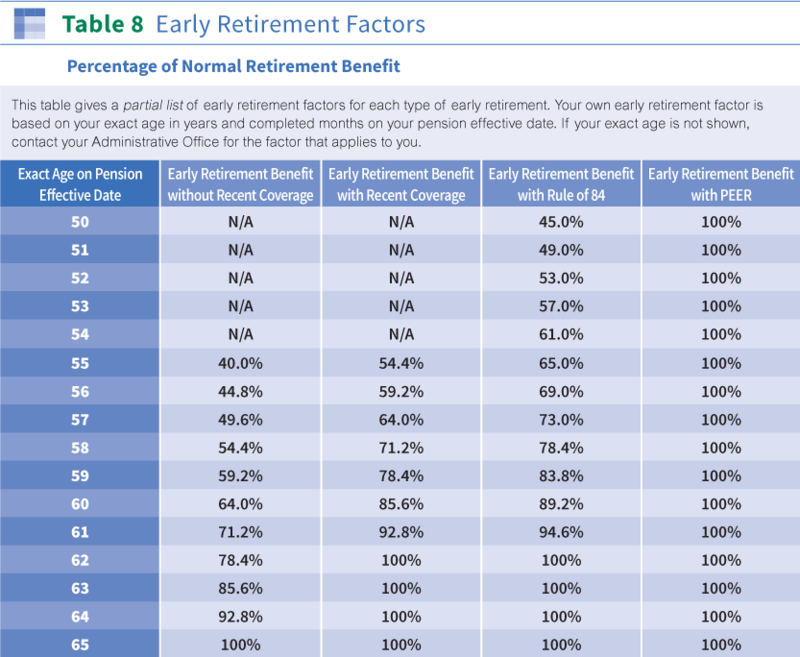 Click here for the early retirement factors. Note: It’s important to point out that you are not eligible to retire under the PEER program until your employer contributions are received and processed by the Administrative Office. If you do not want a lapse in income, you should work at least two to three months after the date you earn your final PEER point. Usually this allows sufficient time to process your application so that you receive your first benefit payment the month following your termination. You can choose to start your disability retirement benefit on the first of any month after you meet all the qualifications for Plan disability benefits. The date cannot be before your disability entitlement date as determined by Social Security assuming you meet all other eligibility requirements. The entitlement date is printed on your Social Security Disability Award Certificate. In some instances, it takes Social Security several months to determine your eligibility for benefits. Your Plan’s disability retirement benefits are not subject to the retro payment rule and may be paid retroactive to the effective date of your Social Security disability benefit assuming you meet all of the other requirements for a disability retirement benefit on that date. Normally, you choose the earliest possible effective date for your Plan’s disability retirement benefit. But if you are within a few months of meeting the age requirements for unreduced early retirement benefits under a PEER program, you may postpone your pension effective date until you qualify for PEER retirement (so that your disability retirement benefit is paid at 100%). Contact your Administrative Office for more information. Note: Special procedures may apply to handling your application for a disability retirement benefit. Click here for more information. Once you reach your normal retirement age, you can choose to start your retirement benefit on the first day of any later month up to your 70th birthday. Click here for more information. Usually, you become eligible for normal retirement on your 65th birthday. However, if you are not vested when you reach age 65, your normal retirement date is postponed until you become vested. Click here for special vesting rules for participants ages 65 and older. If you retire after age 65, your benefit amount is increased for late retirement. This increase accounts for the shorter period of time you are expected to receive payments. Click here for the late retirement factors. Once you reach age 70, you must start drawing your retirement benefits even if you are still working. Your pension effective date cannot be later than the first of the month following your 70th birthday. If your 70th birthday falls on the first of a month, your pension effective date cannot be later than the first of that month. Note: If you are not vested when you reach age 70, your pension effective date is postponed until you become vested. Click here for details on special vesting rules for participants who enter the Plan after age 65. To avoid substantial tax penalties, you should file your application no later than your 70th birthday. This allows enough time for your Administrative Office to process your application so your actual pension payments can start well before April 1 following the year when you turn age 70 1/2. If you miss this deadline and are no longer working, the Internal Revenue Service can impose substantial tax penalties on you. Click here for more information. If you are near age 70 (or older) and not yet receiving your pension, contact your Administrative Office immediately. If you file your retirement application after you retire from employment or after you reach age 65, you can request that your benefit payments go back to the beginning of the month following the date you retired from employment (or became age 65 if earlier) or you can choose a later pension effective date. However, under the Plan’s retro payment rule, your benefit payments cannot go back more than two calendar months from the date your Administrative Office receives your application (three calendar months if your application is received on the first day of the month). 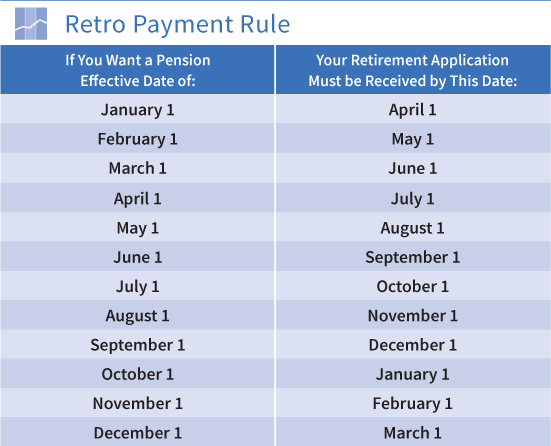 Click here to see the Retro Payment Rule chart. For example, if you retire from employment on June 30, you can choose to have your pension begin July 1 (your pension effective date) as long as your application is received by the following October 1. If your application is received later in October, your pension payments can only go back to August 1. Of course, you can always choose a later pension effective date (up to your 70th birthday). If you are age 70 or older when you file your retirement application, your pension payments go back to the beginning of the month following your 70th birthday assuming you are vested on that date. If you are married, your spouse must also consent to your election of a pension effective date, regardless of the benefit payment option you choose. Click here for the Spouse Consent Requirements. Try to send in your required forms at least three months before your desired pension effective date—even if you have not yet made all your retirement decisions. Section 12 explains the additional documents you need to complete once your application has been processed. These include your Benefit Election Form, Beneficiary Designation Form and tax withholding forms. Note: A different retro payment rule applies for Reemployment Pension Increases. If your first benefit payment is made after your pension effective date, it includes all monthly benefit payments due from your pension effective date up to the date of your first payment. The Plan also pays interest on those retroactive monthly benefit payments. For example, assume you apply for a retirement benefit on September 15, 2013 and choose a pension effective date of July 1, 2013. Your claim is approved on November 10, 2013 and your monthly benefit is $500. Your first regular monthly payment is made for the month of December 2013. At about the same time, the Plan also sends you a payment to cover the benefits due for the months of July, August, September, October and November plus interest. The total amount of your retroactive payment is $2,500 ($500 X 5) plus interest on each of those benefit payments at the rate established by the Internal Revenue Service. Note: Interest is only paid on retroactive benefit payments made as part of the initial payment of your age or disability retirement benefit and certain other monthly benefits under the Plan. Before benefit payments can begin, you must provide your Administrative Office with satisfactory proof of your birth date, and if married, your marriage certificate and proof of your spouse’s birth date. The best proof of a birth date is a birth certificate. If this is not available, the list below shows other acceptable documents. You can also contact your Administrative Office to determine what other proof is acceptable. Your Plan may also require more information such as proof of employment. You should file an application before you have all the documents needed for payment of benefits. Don’t delay applying for benefits just because you may not have all the documents you need. This delay could mean you may not qualify for an earlier pension effective date. Click here for details about the retro payment rule. Option 2. If none of the above are available, two of the following documents are required. One of the two documents must state the date of birth. Option 3. If none of the above are available, provide a letter from the Social Security Administration showing the date of birth accepted for Social Security benefits. The Plan does not notify you when you become eligible to receive benefits. It is your responsibility to stay up to date with your Plan status by reviewing your Personal Benefit Statement and inquiring with your Administrative Office. Once you are ready to retire, you must complete and return an application to the Administrative Office. Click here for questions and answers about Applying for Retirement Benefits.